Download "Purpose: Content: Definition: Benefits: outputs outcomes benefits Business Case dis-benefit Key Responsibilities: Approach: Executive Developed"
1 Key Learning Points The Swirl Logo is a trade mark of the AXELOS Limited. 2 Is used by the Project Board throughout the project to verify its continued viability:- Is the investment in this project still worthwhile? Where business justification is no longer valid, options should be assessed and the project either stopped or changed. The Senior User(s) is responsible for specifying the benefits and subsequently realizing the benefits through the use of the specialist products (outputs) provided by the project. Definition: Presents the optimum mix of information used to judge whether the project is (and remains) desirable, viable and achievable and therefore worthwhile investing in. Projects: create outputs (the specialist products) which result in outcomes (derived from using the outputs) which create benefits (measurable improvements resulting from the outcomes perceived as an advantage by one or more stakeholders) The link between these must be visible so that a project remains focused on its purpose and not as an end in itself. A dis-benefit is a negative outcome (an actual consequence of an outcome perceived as negative by one or more stakeholders). Key Responsibilities: The Executive is responsible for: the Business Case for the duration of the project securing the project funding ensuring that the benefits represent value for money, are aligned to corporate objectives and are capable of being realized the Benefits Review Plan ( during the life of the project) ensuring that benefits reviews are planned and executed The Senior User(s) is responsible for (within their respective areas): specifying the benefits ensuring that the project outcome is specified ensuring that the products are capable of delivering the outcomes ensuring that the expected benefits are realized. The Project Manager is responsible for : Assessing and updating the Business Case at the end of each management stage. Business Case Content: The Business Case contains the business justification based on the expected costs, risks and benefits. It should primarily include: Executive summary Reasons (background as to why the project is needed) Business options (do nothing / do minimum / something) Expected benefits* Expected dis-benefits (negative outcomes) Timescales & costs ( both project and operational / maintenance costs) Investment appraisal (both project and operational / maintenance costs) Major risks (threats and opportunities linked to benefits, timescale & cost) *Once the benefits are defined, the timings and resources required to establish and collect the measures should be described in the Benefits Review Plan. 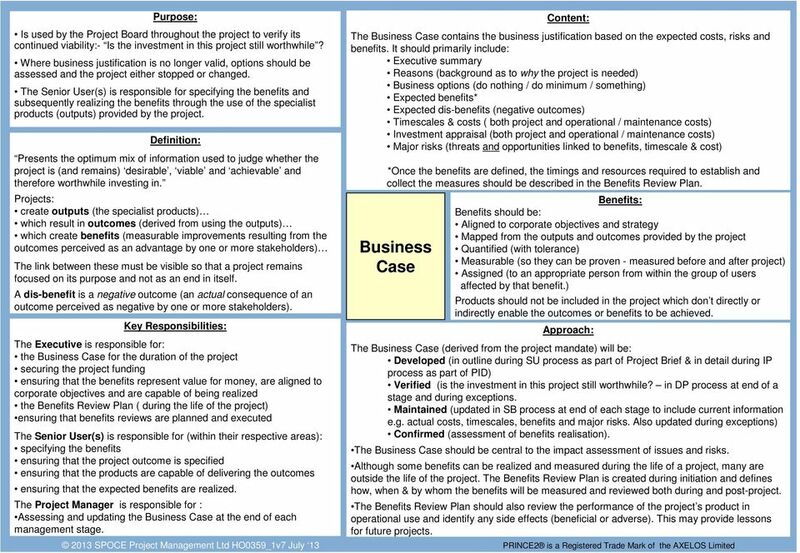 Benefits: Benefits should be: Aligned to corporate objectives and strategy Mapped from the outputs and outcomes provided by the project Quantified (with tolerance) Measurable (so they can be proven - measured before and after project) Assigned (to an appropriate person from within the group of users affected by that benefit.) Products should not be included in the project which don t directly or indirectly enable the outcomes or benefits to be achieved. The Business Case (derived from the project mandate) will be: Developed (in outline during SU process as part of Project Brief & in detail during IP process as part of PID) Verified (is the investment in this project still worthwhile? in DP process at end of a stage and during exceptions. Maintained (updated in SB process at end of each stage to include current information e.g. actual costs, timescales, benefits and major risks. Also updated during exceptions) Confirmed (assessment of benefits realisation). The Business Case should be central to the impact assessment of issues and risks. Although some benefits can be realized and measured during the life of a project, many are outside the life of the project. The Benefits Review Plan is created during initiation and defines how, when & by whom the benefits will be measured and reviewed both during and post-project. The Benefits Review Plan should also review the performance of the project s product in operational use and identify any side effects (beneficial or adverse). This may provide lessons for future projects. 3 Establish project s structure of accountability and responsibilities (the who?) Unites the various parties in the common aims of the project Establish an effective project management structure and strategy for communication to/from stakeholders Enable effective project governance and decision making. Corporate/Programme management: will commission the project, select the Executive and set project tolerances. Defines roles NOT jobs, some of which can be shared or combined. The Project Manager and Executive roles cannot be shared. Changes: due to their dynamic nature projects will always have requests for changes. Depending on their impact (on cost, time, scope, etc) decisions may be delegated to the Project Manager or a Change Authority who has the time and/or knowledge to approve. Limits and responsibilities would be defined in the Configuration Management Strategy. Assurance: The Project Board is responsible for monitoring all aspects of the project s performance and products independently of the Project Manager (covering Business, User and Supplier areas). Will also provide support and guidance to Project Manager. If delegated, MUST remain independent of Project Manager and Project Support. Stakeholders; It is important to identify, analyse and engage effectively with all stakeholders. A stakeholder is anyone who could affect and/or be affected by, or perceive itself to be affected by, the project. Communication Management Strategy: description of means and frequency of communication to parties both internal & external to the project. Definition: The project structure: Is temporary and flexible, based on roles NOT management jobs Is based on a customer / supplier environment Has 3 primary stakeholder areas of interest: Business/User/Supplier represented by the Project Board Is reviewed and changed (if required) at end of each stage. The project management structure has four levels: Corporate or programme management (sits outside of project management team) Directing (Project Board) ) Managing (Project Manager) ) Part of project management team Delivering (Team Manager) ) Organization Project Responsibilities: Project Manager: Responsibility to manage the project on a day-to-day basis to deliver the required products within the constraints agreed with the Project Board. Executive: ultimately accountable for the project. Represents the customer environment, owns the Business Case and ensures the project remains focused on delivering a product that will achieve the benefits. Is the chair of the Project Board. Senior User: accountable for ensuring that user needs are specified correctly and that the solution meets those needs. Responsible for specifying required outcomes and acceptance criteria as well as expected benefits. Commits user resources and confirms benefits have been realised. Senior Supplier: provides knowledge and experience of the main discipline(s) involved in the production of the project s deliverable(s). The Senior Supplier represents the supplier interests within the project and provides supplier resources. Is responsible for the quality of the product. Change Authority: Make decisions on off-specifications and requests for change within delegated limits of authority. Project Assurance: Anyone appointed to a Project Assurance role reports to the Project Board member for the interest concerned and must remain independent of the Project Manager Team Manager: responsible for the production of those products allocated by the Project Manager (as defined in a Work Package). If a Team Manager is not assigned, then the Project Manager undertakes the responsibilities. Project Support: An administrative role, can be in the form of advice and help with project management tools, guidance or admin services such as filing and the collection of actual data. 4 Proactively identify, assess and control uncertainty, and as a result improve the ability of the project to succeed and consequently achieve its objectives. To support better decision making through a good understanding of risk. Effective risk management is a prerequisite to the continued business justification principle. Management of risk is a continual activity performed throughout the life of the project. A risk management procedure should be cost-effective. Every project should have its own Risk Management Strategy and a means of control, i.e. the Risk Register. 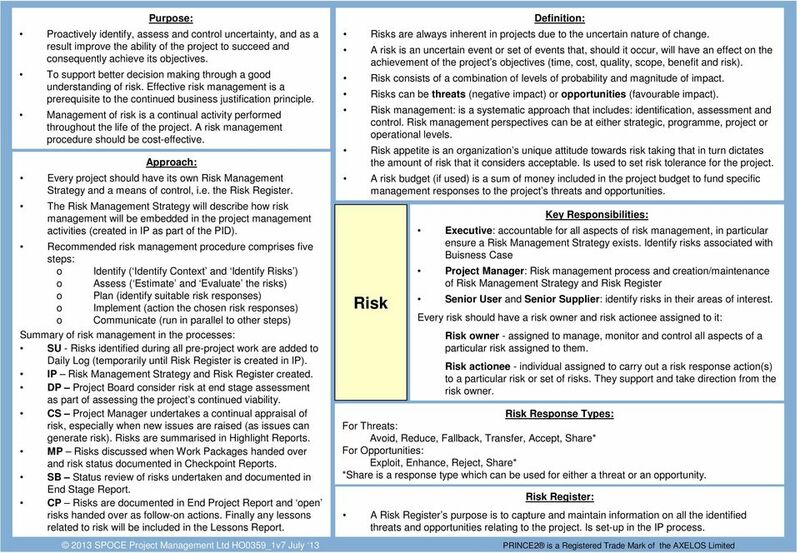 The Risk Management Strategy will describe how risk management will be embedded in the project management activities (created in IP as part of the PID). Recommended risk management procedure comprises five steps: o Identify ( Identify Context and Identify Risks ) o Assess ( Estimate and Evaluate the risks) o Plan (identify suitable risk responses) o Implement (action the chosen risk responses) o Communicate (run in parallel to other steps) Summary of risk management in the processes: SU - Risks identified during all pre-project work are added to Daily Log (temporarily until Risk Register is created in IP). IP Risk Management Strategy and Risk Register created. DP Project Board consider risk at end stage assessment as part of assessing the project s continued viability. CS Project Manager undertakes a continual appraisal of risk, especially when new issues are raised (as issues can generate risk). Risks are summarised in Highlight Reports. MP Risks discussed when Work Packages handed over and risk status documented in Checkpoint Reports. SB Status review of risks undertaken and documented in End Stage Report. CP Risks are documented in End Project Report and open risks handed over as follow-on actions. Finally any lessons related to risk will be included in the Lessons Report. Risk Definition: Risks are always inherent in projects due to the uncertain nature of change. A risk is an uncertain event or set of events that, should it occur, will have an effect on the achievement of the project s objectives (time, cost, quality, scope, benefit and risk). Risk consists of a combination of levels of probability and magnitude of impact. Risks can be threats (negative impact) or opportunities (favourable impact). Risk management: is a systematic approach that includes: identification, assessment and control. Risk management perspectives can be at either strategic, programme, project or operational levels. Risk appetite is an organization s unique attitude towards risk taking that in turn dictates the amount of risk that it considers acceptable. Is used to set risk tolerance for the project. A risk budget (if used) is a sum of money included in the project budget to fund specific management responses to the project s threats and opportunities. Key Responsibilities: Executive: accountable for all aspects of risk management, in particular ensure a Risk Management Strategy exists. 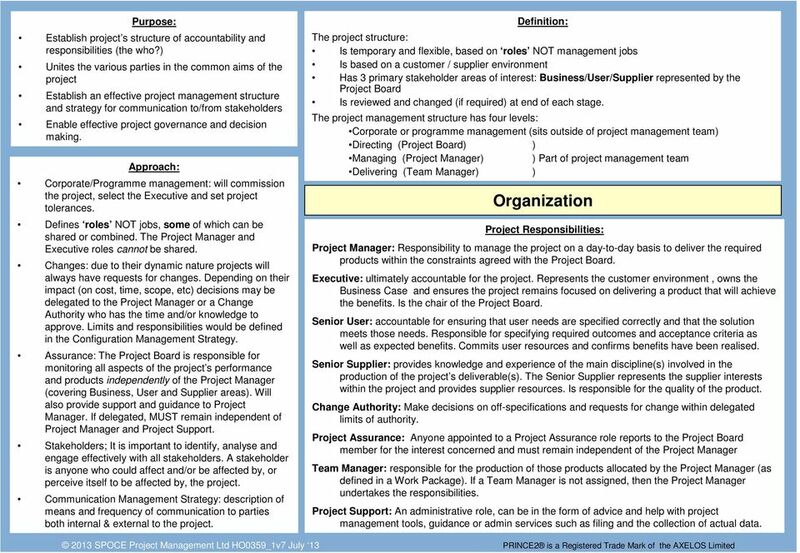 Identify risks associated with Buisness Case Project Manager: Risk management process and creation/maintenance of Risk Management Strategy and Risk Register Senior User and Senior Supplier: identify risks in their areas of interest. Every risk should have a risk owner and risk actionee assigned to it: Risk owner - assigned to manage, monitor and control all aspects of a particular risk assigned to them. Risk actionee - individual assigned to carry out a risk response action(s) to a particular risk or set of risks. They support and take direction from the risk owner. Risk Response Types: For Threats: Avoid, Reduce, Fallback, Transfer, Accept, Share* For Opportunities: Exploit, Enhance, Reject, Share* *Share is a response type which can be used for either a threat or an opportunity. Risk Register: A Risk Register s purpose is to capture and maintain information on all the identified threats and opportunities relating to the project. Is set-up in the IP process. 7 To identify, assess and control any potential and approved changes to the baselines. A common systematic approach to managing issues and changes that inevitably arise from various sources throughout the project. Provides a responsive project environment without becoming out of control. Change control helps to prevent scope creep. Establish Controls (for issues, changes and configuration management) Uses following management products: Configuration Management Strategy defines procedures and authority for handling changes and procedures for uniquely identifying, version controlling, tracking, protecting and baselining products. Configuration Item Records. (One produced per product (or item)) Product Status Account (a report on the status of products) Daily Log (used to manage informal problem/concern type issues) Issue Register and Issue Reports (used for formally managed issues) Configuration Management Procedure (has 5 core activities): Planning Identification Control Status Accounting Verification and Audit Issue and Change Control Procedure Capture formal issues will be recorded in Issue Register and an Issue Report created with an unique issue identifier. Examine undertake impact analysis Propose options analysis may also require Exception Report Decide make a decision on action within delegated authority Implement take corrective action or produce Exception Plan Changes can only be effectively managed against a current known baseline, hence there is a requirement for a configuration management system which sets baselines for, and protects the project s products. Issue and change control procedures need to be integrated with the configuration management system used by the project. Definition; Issue - a relevant unplanned event which requires management action. Issues types are: problem/concern, request for change & off-specification. Can be raised by anyone with an interest in the project at any time. Issue and Change Control - Procedure to ensure identification, assessment and either approval, rejection or deferment. Ensures that every change is agreed by the relevant authority before it takes place. 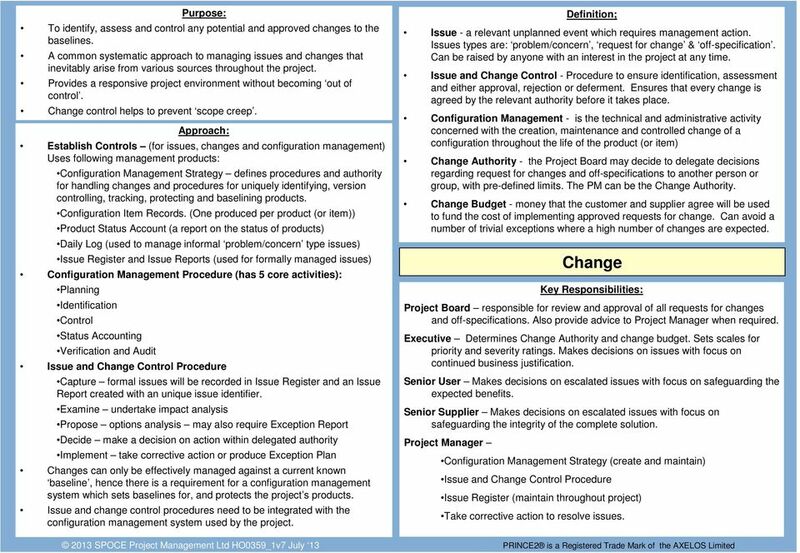 Configuration Management - is the technical and administrative activity concerned with the creation, maintenance and controlled change of a configuration throughout the life of the product (or item) Change Authority - the Project Board may decide to delegate decisions regarding request for changes and off-specifications to another person or group, with pre-defined limits. The PM can be the Change Authority. Change Budget - money that the customer and supplier agree will be used to fund the cost of implementing approved requests for change. Can avoid a number of trivial exceptions where a high number of changes are expected. Change Key Responsibilities: Project Board responsible for review and approval of all requests for changes and off-specifications. Also provide advice to Project Manager when required. Executive Determines Change Authority and change budget. Sets scales for priority and severity ratings. Makes decisions on issues with focus on continued business justification. Senior User Makes decisions on escalated issues with focus on safeguarding the expected benefits. Senior Supplier Makes decisions on escalated issues with focus on safeguarding the integrity of the complete solution. Project Manager Configuration Management Strategy (create and maintain) Issue and Change Control Procedure Issue Register (maintain throughout project) Take corrective action to resolve issues. 8 To establish mechanisms to monitor and compare actual achievements against those planned. Provide a forecast for the project objectives and continued viability. Set tolerances and control any unacceptable deviations. Control of progress is all about decision making: ensuring that the project remains viable against its Business Case. Control is exercised by: Delegating Authority: this is achieved by allocation of tolerances between the four management levels. These are then managed at points of control such as authorisations, progress updates and exceptions/changes. 1. Corporate/Programme Mgt: sets project-level tolerance (for Proj Board) 2. Project Board: sets stage-level tolerance (for PM) 3. Project Manager: sets Work Package-level tolerance (for TM) 4. Team Manager works within but does not set tolerances Raising Exceptions: Exceptions are raised where there is a forecast deviation outside of the agreed tolerance level. Exceptions are raised at 3 levels: Work Package Team Manager will keep the Project Manager informed of Work Package progress via Checkpoint Reports and should raise an issue if the tolerances are forecast to be exceeded. Stage the Project Manager will initially create an Issue Report followed by an Exception Report. If required by the Project Board an Exception Plan will also be produced for their approval. Project this is outside of the authority of the Project Board and should be escalated to Corporate or Programme management (via the Executive). The Project Manager may be required to produce an Exception Plan. 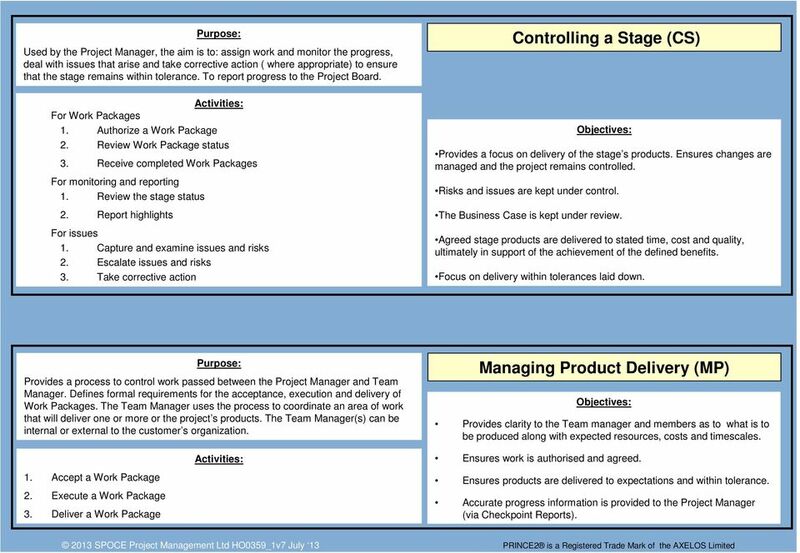 Manage by Stages: Management stages are partitions of a project with management decision points; a collection of products and activities managed as a unit. Only one management stage is authorised and managed at a time. Management stages equate to commitment of resource and authority to spend. A mgt stage can contain one or more technical stages. There will always be a minimum of 2 mgt stages: Initiation as the first and the remainder of the project as the second. Event and Time Driven Controls: Event driven controls (often decision points) include completion of the PID, end stage assessments/end Stage Report, Exception Reports. Time driven controls (i.e. regular progress reports) are the Highlight Report and Checkpoint Report. Definition: Progress - Measure of actual achievement against what was planned. Can be monitored at project, stage and Work Package levels. Progress Controls - Ensures that for each level of the project management team, the next level can monitor progress against the plan, review plans and options for the future, detect problems and identify risks, initiate corrective action and authorise further work. Tolerance - Discretion if things don t go to plan. The permissible deviation above and below a plan s target for time and cost without escalating the deviation to the next level of management. Can be defined for Time & Cost, as well as for Scope, Risk, Quality & Benefit. Time & cost tolerances can be used where there are estimating inaccuracies. Tolerances can be set for the whole project, a stage, a Work Package and at product level (linked to a product s quality criteria). Exceptions - An exception is a situation where it can be forecast that there will be a deviation beyond the agreed tolerance levels. Progress Related Management Products: Baselines for Progress Control: Plans (Project / Stage / Exception) and Work Packages Reviewing Progress: Checkpoint Report, Daily Log, Risk, Issue and Quality Registers and Product Status Account. Reporting Progress: Checkpoint Report and Highlight Reports. End Stage and End Project Report. Capturing and Reporting Lessons: Lessons Log and Lessons Report. 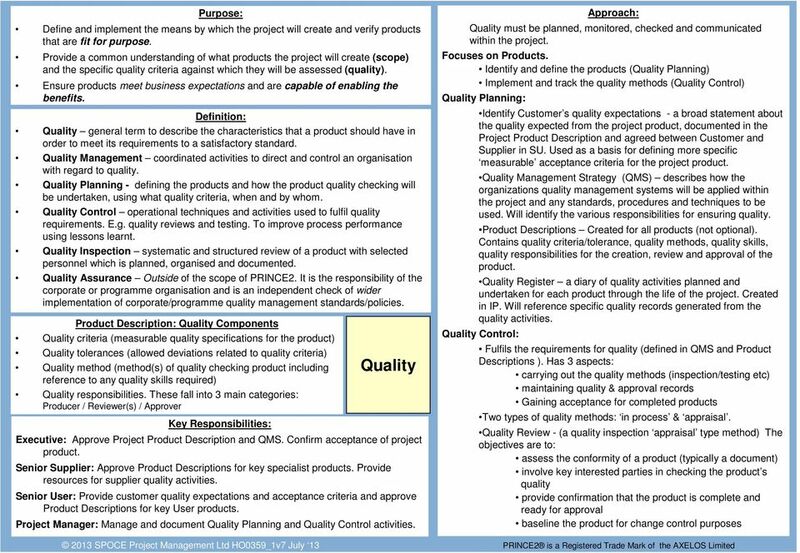 Key Responsibilities: Project Board: Uses Directing a Project process to authorize Initiation, the project itself (including the PID), each stage of the project (Stage Plans), exceptions beyond stage level tolerances (Exception Plans) and project closure (End Project Report). Receives progress updates through Highlight Reports and End Stage Reports. Sets Stage tolerances and manages exceptions and changes using Exception Reports and Issue Reports. Project Manager: Agrees and authorizes Work Packages and Work Package tolerances Monitor stage progress using checkpoint meetings and Checkpoint Reports. Report stage progress using Highlight Reports, raise Exceptions Reports, create End Stage Reports and End Project Report. Monitor via use of Risk, Issue and Quality Registers, Daily Log and Lessons Log. 10 Used by the Project Manager, the aim is to: assign work and monitor the progress, deal with issues that arise and take corrective action ( where appropriate) to ensure that the stage remains within tolerance. 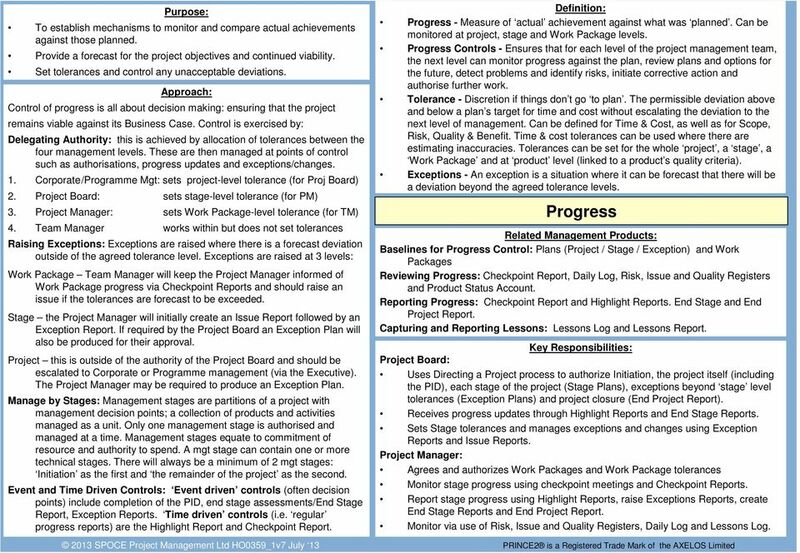 To report progress to the Project Board. For Work Packages 1. Authorize a Work Package 2. Review Work Package status 3. Receive completed Work Packages For monitoring and reporting 1. Review the stage status 2. Report highlights For issues 1. Capture and examine issues and risks 2. Escalate issues and risks 3. Take corrective action Controlling a Stage (CS) Provides a focus on delivery of the stage s products. Ensures changes are managed and the project remains controlled. Risks and issues are kept under control. The Business Case is kept under review. Agreed stage products are delivered to stated time, cost and quality, ultimately in support of the achievement of the defined benefits. Focus on delivery within tolerances laid down. Purpose: Provides a process to control work passed between the Project Manager and Team Manager. Defines formal requirements for the acceptance, execution and delivery of Work Packages. The Team Manager uses the process to coordinate an area of work that will deliver one or more or the project s products. The Team Manager(s) can be internal or external to the customer s organization. Managing Product Delivery (MP) Provides clarity to the Team manager and members as to what is to be produced along with expected resources, costs and timescales. 1. Accept a Work Package 2. Execute a Work Package 3. Deliver a Work Package Ensures work is authorised and agreed. Ensures products are delivered to expectations and within tolerance. Accurate progress information is provided to the Project Manager (via Checkpoint Reports). 11 Enables the Project Board to exercise its control and remain accountable for the project s success whilst delegating day to day management of the project to the Project Manager. Provides a structured environment for making key management decisions. 1. Authorize initiation 2. Authorize the project 3. Authorize a Stage or Exception Plan 4. Give ad hoc direction 5. Authorize project closure Directing a Project (DP) Provides management control and direction through the life of a project. ( starts at the completion of the SU process). Provides authority to initiate, deliver, and close a project. Ensures continued viability of the project. Provides an interface with corporate or programme management. Ensures that there plans in place to realise the post-project benefits. 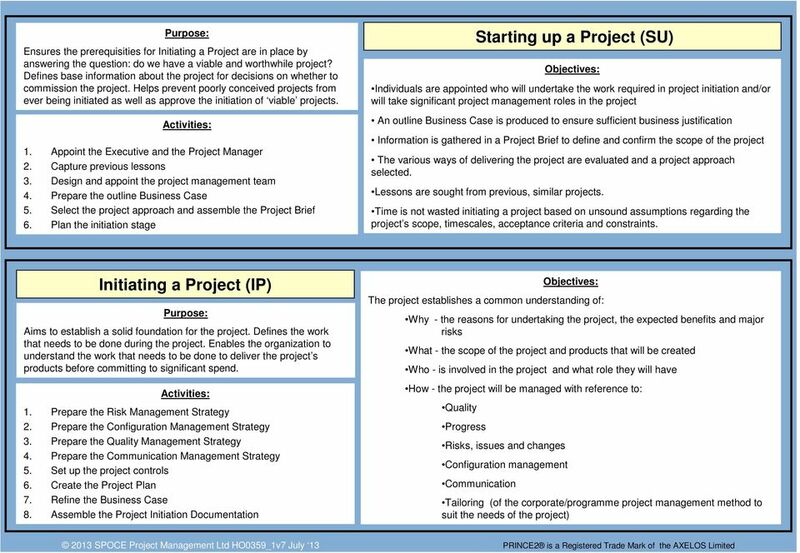 Purpose: Used by the Project Manager at or close to the end of each management stage (except the final stage) to prepare the information required to enable the Project Board to review the success of the current stage, approve the next Stage Plan and confirm continued business justification and acceptability of the risks. Also used when the project has not gone to plan and the stage or project is forecast to exceed its tolerances. The output would be an Exception Plan if requested by the Project Board. 1. Plan the next stage 2. 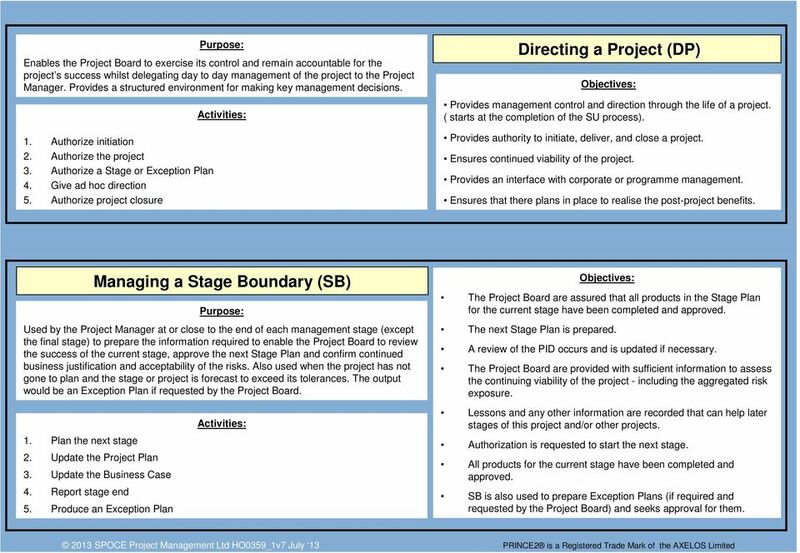 Update the Project Plan Managing a Stage Boundary (SB) 3. Update the Business Case 4. Report stage end 5. 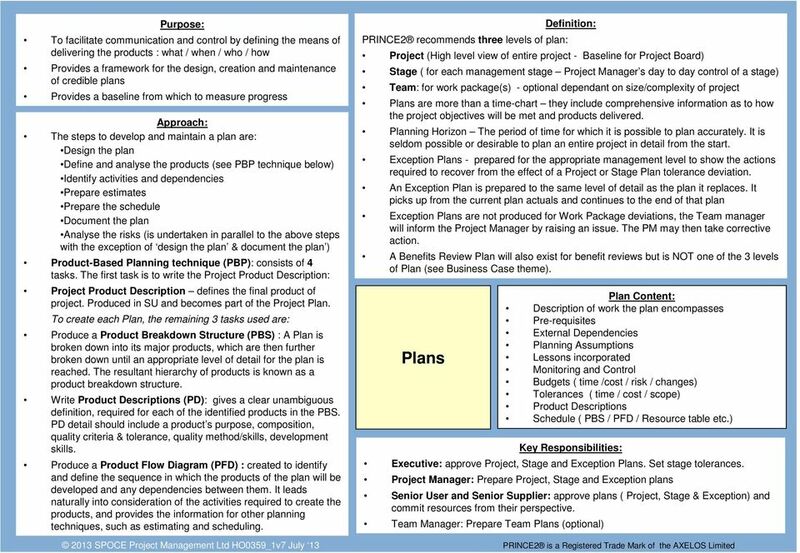 Produce an Exception Plan The Project Board are assured that all products in the Stage Plan for the current stage have been completed and approved. The next Stage Plan is prepared. A review of the PID occurs and is updated if necessary. The Project Board are provided with sufficient information to assess the continuing viability of the project - including the aggregated risk exposure. Lessons and any other information are recorded that can help later stages of this project and/or other projects. Authorization is requested to start the next stage. All products for the current stage have been completed and approved. SB is also used to prepare Exception Plans (if required and requested by the Project Board) and seeks approval for them. 12 Used by the Project Manager towards the end of the final management stage of the project, or in a premature close situation. Provides a fixed point at which acceptance of the project product is confirmed. 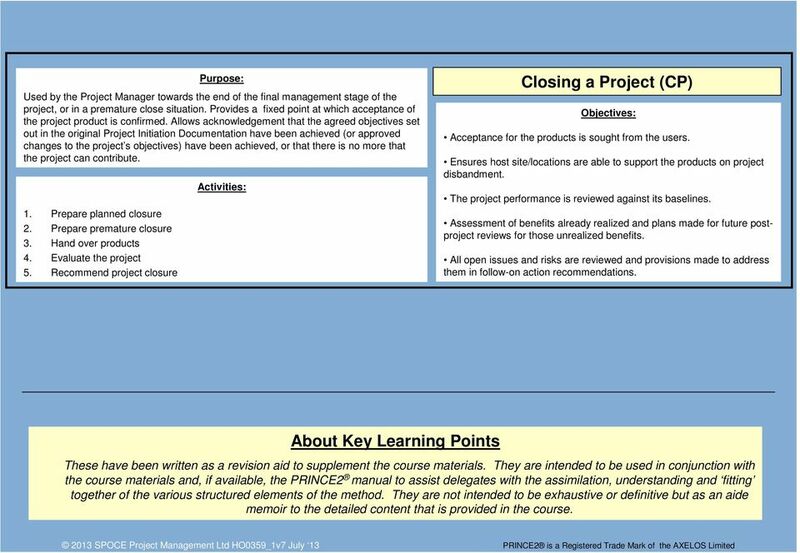 Allows acknowledgement that the agreed objectives set out in the original Project Initiation Documentation have been achieved (or approved changes to the project s objectives) have been achieved, or that there is no more that the project can contribute. 1. Prepare planned closure 2. Prepare premature closure 3. Hand over products 4. Evaluate the project 5. Recommend project closure Closing a Project (CP) Acceptance for the products is sought from the users. Ensures host site/locations are able to support the products on project disbandment. The project performance is reviewed against its baselines. Assessment of benefits already realized and plans made for future postproject reviews for those unrealized benefits. All open issues and risks are reviewed and provisions made to address them in follow-on action recommendations. About Key Learning Points These have been written as a revision aid to supplement the course materials. They are intended to be used in conjunction with the course materials and, if available, the PRINCE2 manual to assist delegates with the assimilation, understanding and fitting together of the various structured elements of the method. They are not intended to be exhaustive or definitive but as an aide memoir to the detailed content that is provided in the course.